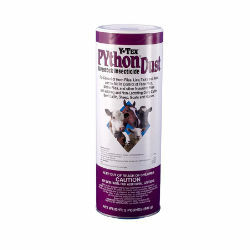 Synergized PYthon® Dust is the most significant livestock dust innovation in 20 years. It is the only dust to contain two novel active ingredients for maximum efficacy against all major livestock ectoparasites. Zetacypermethrin is a 4th generation pyrethroid, single-isomer insecticide with enhanced potency against resistant horn fly strains. The photostable form of piperonyl butoxide is a mixedfunction oxidase inhibitor that reduces metabolic resistance in insects, thus synergizing the pyrethroid for maximum efficacy and residual activity. Controls horn flies, lice, ticks and keds. Aids in control of face flies, stable flies and other nuisance flies. For use on lactating and non-lactating dairy cattle, beef cattle, sheep, goats, and horses.